On the 7th day of the blessed month of Tout, Sts. 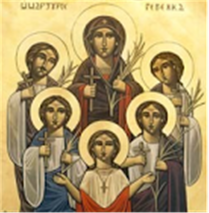 Agathon, Peter, John, Amun, and Amuna and their mother, Rebekah, were martyred. They were from Kemola of the district of Kus. Our Lord Jesus Christ appeared to them and informed them of what would happen to them, and that they would receive the crown of martyrdom in the city of Shoubra which is near Alexandria, and that their bodies would be carried to the city of Nakraha in the province of El-Behairah. The Saints rejoiced at this vision, and they rose up early and gave all their possessions to the poor. Agathon, their eldest brother, was a man of high position in the city and was loved by everyone. Rebekah, their mother, strengthened and encouraged them to endure the torture in the name of the Lord Christ. They came to the city of Kus and confessed their faith in Christ before Dionysius, the Governor. He tortured them severely, starting with their mother who bore the torture patiently and with joy, and then he tortured her five children. When he was weary of torturing them, he was advised to send them to Alexandria so that they might not lead other people astray, for they were loved by everyone. Because of them, many confessed their belief in the Lord Christ and received the crown of martyrdom. Finally, he ordered to have their heads cut off and to have their bodies drowned in the sea. They cut their heads off and placed their bodies in a boat to cast them in the sea. God sent forth His angel to a rich man from the city of Nakraha and commanded him to take the bodies of the saints and the man was exceedingly glad. He came to where the bodies were, gave the soldiers much silver and took the holy bodies. He laid them in the church, and he heard a voice saying, "This is the abode of the righteous." The bodies remained there till the end of the era of persecutions. They then revealed the bodies and a big church was built for them. God made manifest from their relics, many signs and wonders. Then they transferred the bodies to the city of Sonbat, where there is now a church known as "The Five and Their Mother" or "El-Sitt Refka" (Lady Rebekah). Many visit this church every year to receive their blessings. Their intercession be for us all. Amen.